Morrigan Crow has been invited to join the prestigious Wundrous Society, a place that promised her friendship, protection and belonging for life. She's hoping for an education full of wunder, imagination and discovery but all the Society want to teach her is how evil Wundersmiths are. And someone is blackmailing Morrigan's unit, turning her last few loyal friends against her. Has Morrigan escaped from being the cursed child of Wintersea only to become the most hated figure in Nevermoor? Miss Morrigan Crow, calamitous young lady of the Wintersea Republic is now preparing to become an esteemed scholar of the Wundrous Society, accompanying eight fellow students including the marvellous Hawthorne. Although compelled to confidentiality considering the dastardly mayhem instigated by Wundersmith Ezra Squall, Morrigan's Wundersmith ability is discovered and unscrupulously, an unknown antagonist is conspiring towards the extraordinary children with a bizarre series of anonymous notes and peculiar stipulations. Fragments throughout the Wundrous Society community have vanished, scholars, colleagues and acquaintances. Instinctively Miss Morrigan Crow is a suspect as an accused nefarious Wundersmith but with the steadfast assistance of the nonchalant Hawthorne, Jupiter North, Jack and an unlikely collaborator, Morrigan is determined to preserve the Wundrous Society, Nevermoor and substantiate that a Wundersmith is fantastically wundrous. Morrigan Crow is a intelligent and practical young woman. 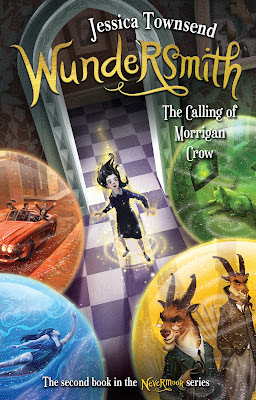 Forsaking the calamity and misadventure of the Wintersea Republic, Morrigan is now a resident of Nevermoor, liberated by Jupiter North to compete in the Wondrous Society tournament. As a Wundersmith, Morrigan attends a specialised program consisting of the history of the Wundersmith and their heinous atrocities. Throughout the narration, Morrigan discovers that beneath the fantastical facade of Nevermoor, wickedness is awakening. Jupiter North is investigating an illegal marketplace in correlation to the community members. His extended absences further isolating Morrigan as she adjusts to her new environment. Morrigan is challenged by prejudice and at a disadvantage, increasingly isolated from her fellow scholars and Society facility, fearing the Wundersmith notoriety. Her Society companions are disciplined within their individual abilities however, Morrigan is secluded and denied an education despite Jupiter protesting for equality. The demeanour of Wundersmith Ezra Squall reflects on Morrigan and although only twelve years of age, she is held responsible for the actions of her predecessor. Outlandish! The grand Hotel Deucalion is resident to a fictionally diverse and eclectic community and although Jupiter is her guardian, Morrigan relies upon the Deucalion residents for guidance and perspective. Fenestra the talking Magnificat, Jack the nephew of Jupiter who returns from boarding school on weekends, the operatic singer and the vampire dwarf with a penchant for lavish carousing. Hawthorne Swift is a tremendous character, friend and entourage for Morrigan. His solidarity is unconditional and although his character appears humorous and sprightly, he fiercely defends his friend against Morrigan naysayers. Former antagonist Cadance Blackburn is delightfully surprising. Although adversaries, Cadance recognises the importance of Morrigan and her abilities as they cooperate to solve the mystery of the illegal marketplace. The atmospheric enchantment of Nevermoor is an experience. The fantastical Brolly Rail as it bustles throughout the expansive metropolis, the intricate and deceptive thoroughfares and animated diorama of Nevermoor and the residents. Nevermoor is fantastically imagined and beautifully illustrated. Although the world is intricate and voluminous, it's encompassed by a wonderful intimacy and warmth. Nevermoor transcends children's literature, captivating and enchanting audiences. Categorically breathtaking. Hi! Hope you been well! I'm logging onto my blog after a year lol, we used to keep in touch on each others blogs, and I use instagram as my blog now. I'd love for us to keep in touch on there! The link is below. So lovely to hear from you again Benish! I'll see you on Instagram darling! She's one of those characters that will appeal to readers of all ages. The series is magnificent! I'm really loving the sound of the world in this series, and Morrigan sounds like a wonderful character. Great review Kelly, I've missed you! So thrilled to see you again Amber! I was on a little hiatus but have been keeping up with your reviews. Such a wonderful read, fun and fantastical! The world building is incredible, I think you would really enjoy this one too! Beautiful review. I'm so glad to see you loved this one. I've had the first book on my wish list for a long time now, so it sounds like I really need to find a copy soon. It's always nice to hear that a sequel is just as great! It's equally as lovely as the first. Morrigan is maturing into quite the determined and courageous young lady but with such a wonderful dry sense of humour. You'll enjoy this series Lauren, can't wait to see what you think of it! Thanks for sharing your thoughts on this story. It sounds fantastic! The characters sound great, especially the secondary ones, and I really love the descriptions of the world itself. There really are some wonderful middle grade books out there right now. There certainly are Suzanne, especially by Australian authors. The Nevermoor series is inedible and will appeal to a wide range of readers, both young adult and middle grade. This book sounds amazing! Fantastic review Kelly! and I really need to move book one up on my to-read list. Oh gosh, yes you do! You'll regret having waited so long to read it Sarah. Mid-grade is just amazing these days. They stories are so clever and relevant that they can be read by all ages. My gosh, I have so got to get into this series!